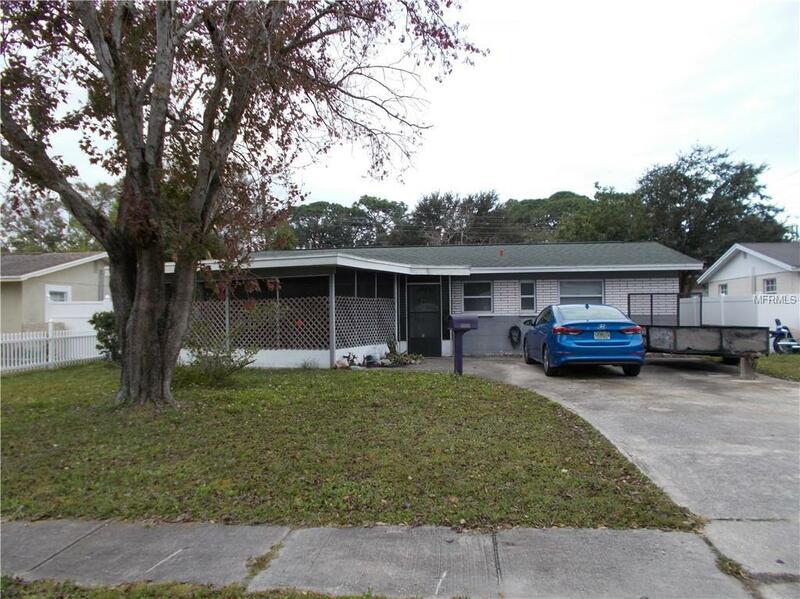 This fantastic 3 bedroom 2 bath home in the heart of Pinellas Park is ready for a new family! HUGE screened in porch makes it easy for outside living in our warm Florida climate. Once inside, the layout seems MUCH larger than the square footage... combination living/dining area upon entry give amble room for formal living and eating. The kitchen has been beautifully updated with oak cabinets, built in desk area, tons of storage and even a sitting breakfast bar for those quick bites! The appliances have all been update and there are 2 ceiling fans. Adjacent to the kitchen is a laundry/facility room with a door to the front porch for extra convenience. There is a family room off the kitchen with sliders to the large newly fenced backyard. The 2 guest bedrooms are roomy and the master bedroom has its own master bath with shower. There is tile or terrazzo throughout for easy maintenance. The 2 flat roofs were replaced last year and the main roof in 2004. Home Warranty included in purchase! !